Non-line-of-sight (NLOS) imaging has been an active research area for almost a decade, and remarkable results have been achieved with pulsed lasers and single-photon detectors. The wow factor comes from using only light that has bounced off of a diffuse surface and thus has seemingly lost all spatial resolution. Still, the use of expensive equipment to obtain picosecond-resolution time-of-flight data separates this vastly from everyday human experience. Our work shows that NLOS imaging is possible using only an ordinary digital camera and relatively simple computational algorithms. Based on this, it is even conceivable for humans to be able to learn to see around corners with their own eyes; it does not require anything superhuman. Mirrors and matte walls are quite different. When light reaches a mirror, it reflects at a single angle specified by the law of reflection; when light reaches a matte wall, it is scattered in all directions. Thus, to use a matte wall as if it were a mirror requires some mechanism for regaining the one-to-one spatial correspondences lost from the scattering. No optical technique can undo scattering, but computational imaging can approximately separate (or unmix) the light that travels different paths to a detector. In essence, computation can turn a matte wall into a mirror. While I may have made computational unmixing of light to enable NLOS imaging seem plausible, it is not obvious or computationally easy. Before our work, unmixing had always been based on separating paths of different lengths, which requires time-resolved sensing. Suppose that in an otherwise dark environment, one point on a visible wall with a matte finish is illuminated (e.g., with a laser), and a detector is focused on one point on the same wall. Since reflections on this wall are diffuse, the illuminated point (S in the diagram) becomes an omnidirectional “virtual” source, and the point at which the detector is focused (D in the diagram) becomes an omnidirectional “virtual” detector. The measured light intensity will depend on all paths from virtual source to virtual detector, including those involving multiple reflections. Since all paths are being combined, static measurements of light intensity would be quite uninformative: Moving the virtual source or virtual detector would change the measurement very little, and forming an image of the scene is implausible, even with many combinations of virtual source and virtual detector positions. With very short illumination pulses and time-resolved sensing, all those paths for light travel at least become separated by path length. Considering just the paths from virtual source to virtual detector with one bounce in the hidden scene (or three total bounces from light source to visible wall to hidden scene to visible wall to detector, as shown with the hidden scene point B), the intensity at one instant in time corresponds to contributions from an ellipsoid because the locus of points with fixed sum of distances from the virtual source and virtual detector is an ellipsoid. Exploiting this separation of light paths with several combinations of virtual source and virtual detector positions enables localization of reflecting surfaces in the hidden scene. Our method is based on modeling that is perhaps simpler and equipment that is definitely cheaper. Instead of requiring time of flight to separate light paths, we rely on the existence of an opaque occluding object in the scene. When we fix a camera field-of-view (FOV) (a portion of the visible wall), wherever the occluder happens to be, there will be a portion of the hidden scene with the property that it is blocked from some part of the camera FOV and not blocked from some other part of the camera FOV. We define this portion of the hidden scene as the computational FOV, as shown to the left. We can compute an image of the computational FOV because of the separation of light paths created by the occluder. Restating this from the perspective of the hidden scene, light from the computational FOV neither reaches the whole camera FOV nor is blocked from the whole camera FOV. Therefore, the occluder and light from the computational FOV create a penumbra—a pattern of partial shading as in the image below—in the measured camera image. 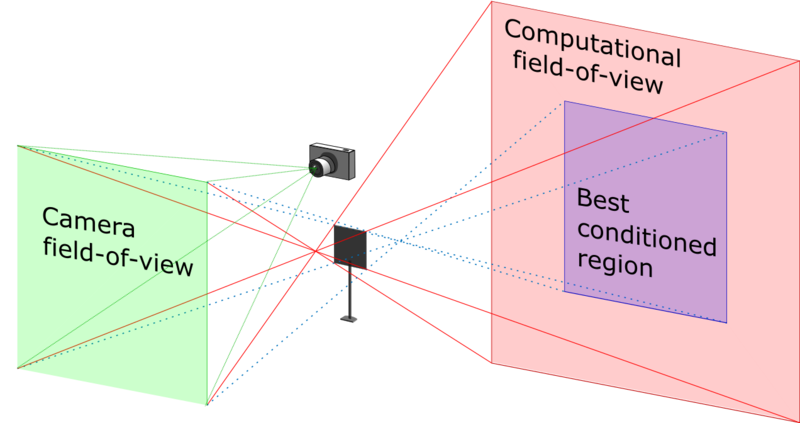 As detailed in the paper, the solution of a linear inverse problem maps the camera measurement to an image of the computational FOV. Penumbrae are often very weak and appear to be nothing but blurry messes. Our work certainly makes me look at them differently, always wondering how much could possibly be inferred. The ideas behind this work with Charles Saunders and John Murray-Bruce from my group at Boston University were not generated in a vacuum. We have been working on NLOS imaging as part of a DARPA-funded team with several co-PIs at the Massachusetts Institute of Technology: Fredo Durand, Bill Freeman, Jeffrey Shapiro, Antonio Torralba, Franco Wong, and Greg Wornell. Torralba and Freeman have, in particular, exploited occlusions to produce “accidental cameras” in earlier work.